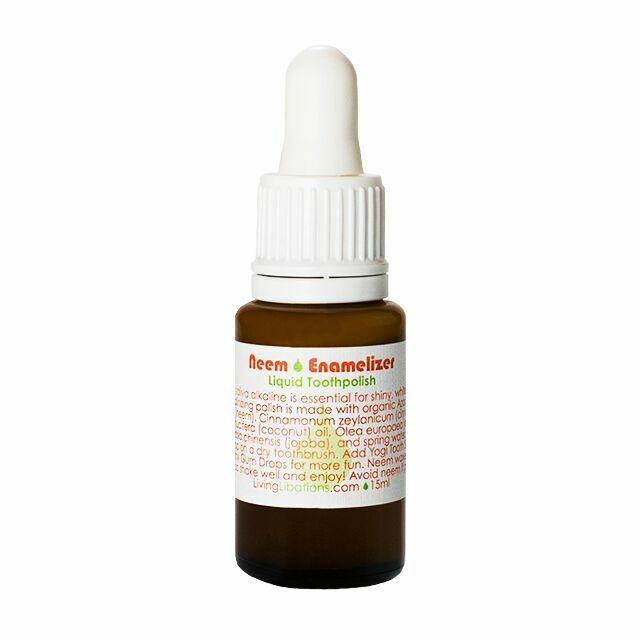 Living Libations Neem Enamelizer Liquid Tooth Polish is specially formulated to replace regular toothpaste. Keeping saliva alkaline is essential for a bright, white smile. Neem Enamelizer will leave your teeth feeling smooth and polish your teeth to pearly perfection. Only one tiny drop is needed on a dry tooth brush. Our Neem Enamelizer Liquid Tooth Polish is different in function and results from our Yogi Tooth Serum and Healthy Gum Drops products. Neem Enamelizer Liquid Tooth Polish can replace toothpaste and is for the brushing stage only. Whereas the Tooth Serums are for many phases of oral care, including: brushing, flossing, massaging gums, post-dentistry. Replace toothpaste with just a single drop on a dry toothbrush. It is safe to swallow. Use every day when brushing or when you want to give your mouth a spa day. Follow the rest of Successful Oral Care steps. Shake well. Neem extract is rich in benevolent botanical waxes, these waxes are key to oral care, yet can thicken. If the liquid gets thick, gently warm and shake. Avoid neem while pregnant. Asadirachta indica (Neem), Saponified Olea europaea (Olive Oil), Cocos nucifera (Coconut Oil), Simmondsia chinensis (Jojoba), Saponaria officinalis (Soapwort), Spring Water, and Cinnamomum ceylanicum (Cinnamon). Neem (Asadirachta indica) Essential Oil – TIn Sanskrit, the word for neem is ‘arista,’ which translates to “perfect, complete, and imperishable” and has been used for thousands of years in Ayurvedic practices, Neem and your toothbrush have Wonder Twin powers for your mouth. This herbal, waxy-wonder busts up plaque and tartar, polishes teeth, and leaves your smile bright, clean, and white. Saponified Olive Oil (Olea europaea) – Our organic saponified olive oil captures all of the nourishing, moisturizing properties of olive oil while enhancing the oil’s ability to help remove plaque from the teeth. Saponification is a chemical reaction that occurs when the oil is treated with a highly alkaline solution. Virgin Coconut (Cocos nucifera) – This diverse lip is a caring carrier oil and botanicalbiotic coconspirator that balances oral ecology. This optimal oil soothes the oral tissue and gently removes bacteria that cause bad breath. Jojoba (Simmondsia chinensis) Oil – Jojoba is known for its incredible skin benefits, and it is also a chief player in natural oral care. Jojoba’s loving lipids easily soothe oral tissue. Soapwort (Saponaria officinalis) – As the name suggests, Saponaria is a beautiful, very gentle natural soap herbal cleanser. Cinnamon (Cinnamomum ceylanicum)Essential Oil – Our true cinnamon bark essential oil from Madagascar is is a potent plaque cleanser and breath freshener. It is a classic spice, and tastes nice, too!. I NEVER WANT TO BE WITHOUT THEM! Thank you for the most amazing potent and pure products! I am so in love with the Neem Enamalizer (30ml) and Happy Gum Drops which I purchased not long ago. My oral care has reached a new level and the results are amazing! Each day when I use the product it’s a sacred ritual for me and I never want to be without them! I just can’t truly explain how absolutely wonderful this brand is! This is the third product I’ve added to my Living Libations oral care and my mouth is beyond happy. I do not love the taste of neem but do you know what else I do not love – drills and unnecessary procedures at the dentist. I do LOVE the results. The appearance of my gums have stopped bleeding, my teeth are a new clean if that makes sense LOL and my morning breath is less potent. I will never ever purchase toxin filled toothpaste again. I’m excited to share it with my family & friends. I’m so happy. I first ordered the Yogi serum and ozonated happy gum drops, but after seeing Nadine’s video on self dental care, I realized I needed the Neem Enamalizer. This is my least favorite tasting of the 3 by far, but as another reviewer said; I don’t like the taste but I also don’t like drills and dental work, so I tolerate it! It’s expensive, but since you literally use one drop, it’s going to last me a very long time. I will continue to use this from now on.